The objective of OIKONET -the OIKODOMOS Network- is to create a platform of collaboration to study contemporary housing from a multidisciplinary and global perspective by encompassing the multiple dimensions which condition the forms of dwelling in today’s societies: architectural, urban, environmental, economic, cultural and social. The consolidated OIKODOMOS Virtual Campus (www.oikodomos.org) will grow into a network by: 1. Incorporating other disciplines to the study of contemporary housing, such as economics, social studies and historical preservation; 2. Including social and community organizations in the design and implementation of learning activities; 3. Addressing the global dimension of housing research, with the participation on non-European partners; 4. Expanding the OIKODOMOS Virtual Campus to a larger number of institutions, inside and outside Europe and 5. Enhancing the existing digital platform with new environments which will support the network's learning activities. 3. Pedagogical activities which bring together different stakeholders, learning environments and disciplines. The three subnetworks become strongly intertwined through the project activities. Relevant issues on contemporary housing studies discussed by researchers and experts will provide themes to design learning activities; existing problems at the community level will provide study cases to develop design workshops with the participation of academic and non-academic stakeholders; and housing problems will be analyzed in collaboration with local stakeholders. This way, OIKONET will give rise to a new structure which will foster the exchange among research groups and higher education institutions, to interlink research activities with the collaborative design of learning activities, and to embed learning processes in the social, cultural and economic environments. Promoting pedagogic innovation in the field of housing studies is the ultimate goal of OIKONET. The learning activities carried out in the network will overcome boundaries between physical and digital learning spaces by promoting a blended learning approach which was successfully developed in the OIKODOMOS virtual campus. A digital environment will support the exchange of knowledge across the different areas of knowledge represented in the network and the communication among the participants. 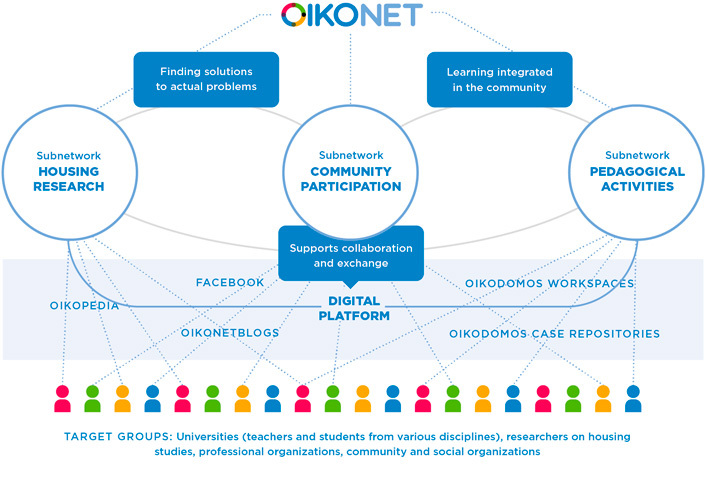 OIKONET partners are universities, research organizations, local administrations, professional, and social organizations, within and outside Europe. Altogether, the interaction across different stakeholders and disciplines will provide new insights on the contemporary housing conditions, and will help to forge links between academia and the social and economic milieu, between research and learning, and between the EU education space and other universities around the world.